Cavities Your Dentist Didn't Know You Had | OhGizmo! By awesome on 08/22/05 • Leave a comment! I am extremely fortunate. I have never had a cavity found in or on my teeth. This may or may not be related to the fact that I have only been to the dentist once in my life (and I ain’t ever going back!). If I did go to the dentist, and I had a cavity that could not be normally seen (subsurface or just beginning) and the dentist had KaVo corporation’s new Diagnodent, well he’d be able to detect it and treat it anyway by measuring the laser fluroescence within the tooth structure, as opposed to just telling me that I have wonderful teeth and sending me on my merry way. 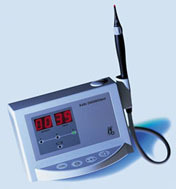 In other words, the machine uses a laser to scan the surface of your tooth and find little, hard to reach cavities. If you ask me, some things are better left unknown (just in my case – for everyone else I think this is a great idea!). Visit the Diagnogent product page here. Story VIA ABC19 news.